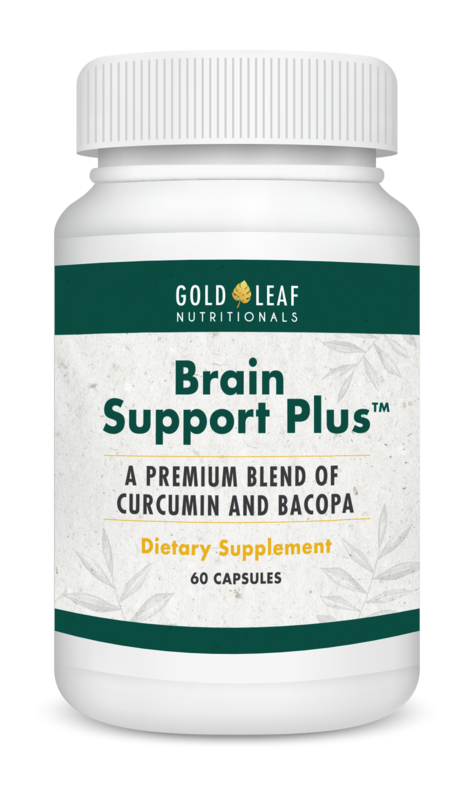 Curcumin and bacopa have both been used for thousands of years to help support brain health and function. There’s one big problem with most curcumin supplements – they aren’t absorbed very well. The optimized curcumin in Brain Support Plus has been shown in a human study to be 65 times more bioavailable than regular curcumin. That means more of it can get to your brain where it can work its magic. Get Brain Support Plus™ Today! What are the quality standards Gold Leaf Nutritionals uses for their formulas, including Brain Support Plus? The facility we’ve partnered with has been inspected and registered as a GMP-compliant facility by the NSF International, an industry organization that has even stricter standards than the FDA. Is there any soy or gluten in Brain Support Plus? Each batch of Brain Support Plus is tested to make sure it gluten-free according to FDA regulations. Brain Support Plus does contain soy. Is Brain Support Plus GMO-free? Brain Support Plus is a non-GMO product. Is Brain Support Plus made in the USA? All you need to do is take 2 capsules once per day, between meals. Yes, your supply of Brain Support Plus is 100% protected by our no questions asked anytime guarantee. You have an unlimited amount of time to try it out. If at any time you’re not thrilled with your results, we’ll refund you every penny of the product price. Try Brain Support Plus Today! Try Brain Support Plus today for less than the cost of a bottle of water a day. Its special blend of optimized curcumin and bacopa extract will go to work right away to promote optimal brain function. Start giving your brain the support it needs. And… if you aren’t thrilled with your results, we’ll give you back every penny of the product price.